Transportation continues to be a major issue in the Tampa Bay Area. There have been multiple failed efforts to convince the public to tax itself for the development of transportation initiatives. which can be a boost to local marketing and advertising therefore stimulating the economy, and finally providing tourists with a way to see areas that they may not have if they just took a taxi from the airport to their final destination (again, a possible benefit to local businesses! Let's say I spend $100 a week in purchases that are taxable. That means that i would be paying an extra $1 to help the local economy in a big way. Is that really that big of a burden for me?.... Absolutely not and I think that if the "Train" initiative was presented as only costing a $1 a week, (which is probably double what most people spend in taxable purchases, remember "real" food isn't taxed) that the vote would be to pass an increase in county tax! All that people such as yourself seem to blog about is how these things are going to cost YOU and your like minded individuals. I ask that you take the time to think about and write about both sides of the argument. Think about how your $1 could actually help others! We as a community need to think not only about 1 year from now but 5, 10, 20 years from now! The last I heard, more people are moving into Florida than out of it. Thanks for taking the time to read my opinion! You make a very good point. The problem all along has been the bay area people behind light rail are mostly developers and real estate people. Their principal objective has been to use publicly funded light rail to start transit-oriented redevelopment of Pinellas County. 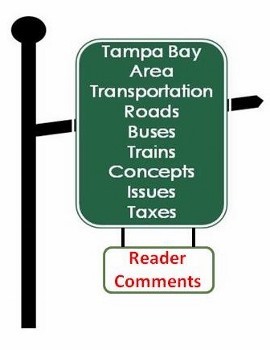 You only have to look at the meandering route of the failed GreenLight Pinellas effort to see this approach at work. The entire GreenLight effort focused on creating new centers of development and not on improving public transportation. There was also no significant GreenLight effort to resolve the "last mile" issue. This approach rarely works in the US. If we had a serious transit plan that solved the "last mile" problem and put light rail where it would be effective I agree that the public would support it. The CSX tracks offer a significant opportunity, but the "last mile" problem is huge in the CSX scenario. E-mail Doc at mail to: dr.gwebb@yahoo.com or send me a Facebook (Gene Webb) Friend request. Please comment below, and be sure to Like or share on Facebook. The other glaring shortcoming of the Go HIllsborough plan is that it lacks a technical component. The problems that need solving by a transportation plan are measurable: vehicles per day, cost per trip, capacity, growth projections. And yet there are no quantifiable performance standards offered, and no way to measure success after action is taken. No way to differentiate between alternative modes of transportation. In the private sector, if you show up in the boardroom looking for money without these data, you get tossed out on your ear. Our Board of County Commissioners should demand these data as a minimum requirement for any plan or proposal submitted for funding consideration. "We as a community need to think not only about 1 year from now but 5, 10, 20 years from now! The last I heard, more people are moving into Florida than out of it." Those two points are the essence of the opposition to recent "alternative transportation" initiatives in Pinellas and Hillsborough counties. We do need to be looking out 5, 10, 20 years from now - and we will definitely see significant population growth during that time. At the rate technology is growing, we will see the implementation of self-driving cars and a greater dispersion of jobs throughout the county (including telecommuting from home or branch locations). Ride-sharing services will be widespread and offer more economical and more useful transit solutions than buses and trains - as soon as the useless and corrupt Hillsborough PTC is dissolved, we can begin seeing some of these benefits. All one has to do is read the postings on this blog to see many examples of mismanagement of public transit all over the country and the futility of throwing enormous amounts of taxpayers' hard-earned money at transit "solutions" that are epic failures. Buses are capable of moving large numbers of people in many different directions, yet they are under-utilized even though they are almost completely paid for by taxpayers and nearly free for riders. If there were demand, we would have more buses. Trains are exponentially more costly and much less efficient - again at taxpayers' expense. Both modes have proven to be ineffective at producing any of the outcomes CV suggests in other metropolitan areas, why would they be any more successful in Florida? This is not about each individual contributing $1/week, a 1% sales tax will produce over $200 MILLION/year, growing as more people move to Hillsborough County. That is a significant amount of money to be casually committing to the whims of politicians who have already demonstrated that (a) they are not sure what they would do with the funds if a 1/2% sales tax were passed and (b) so far they have been more than willing to spend taxpayers money on projects that had nothing to do with the intended purpose(s) of the taxes they have already implemented. with the additional fact that the PSTA board, made up mostly of elected politicians, has demonstrated that they have no understanding of how to manage a relatively small bus transit operation effectively or efficiently. 62% of the voters in Pinellas were not willing to trust these politicians with another $100 million+ per year to try their luck at building and operating a $3.3 BILLION train, all paid by taxpayers. The Greenlight plan estimated that less than 3% of Pinellas residents would actually ride that train. Is that what you envision as responsible management of your money? The good news to all this is, the "First Mile, Last Mile" problem is being worked on...by both HART and PSTA. Having this problem resolved will no doubt help build support amongst those who have been reluctant to support any sort of public transit expansion. While we cannot satisfy everyone (I know well that the Calverts will never be satisfied unless TBX gets built instead of passenger rail lines), we can come up with a regional plan that will be able to benefit most of our populace. A plan that will include roadway fixes, transit expansion/improvements, and pedestrian/bike facility expansion/improvements. Also, the Hillsborough PTC needs to be abolished as soon as possible to allow ridersharing to grow in the county. I also would not mind abolishing TBARTA because they were not given the powers to do anything productive for our region. Finally, while I stronly oppose the construction of TBX and know how much damage it will do to our region, the project is becoming harder to stop altogether. So the discussion must turn to ways that the project can be less destructive to our communities and also provide a framework for a "true" bus rapid transit line along the corridors.